The general consensus is that the briney beast’s bite could easily crush a Hummer. Predator X falls into the category of pliosaur, and at an estimated length of 50 feet long, it is easily the largest variety of pliosaur to date. 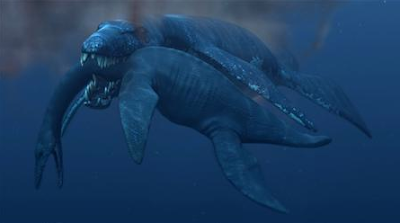 It’s long been theorized that one of the greatest cryptozoological beasts - The Loch Ness Monster - is indeed, a pliosaur. While know-it-alls and pointy-heads are quick to dismiss the possibility that such a creature still exists and inhabits Loch Ness, countless eyewitness sightings and filmed and video taped evidence continues to surface (no pun intended) regularly. More significantly, regardless of where you might fall on the pro-or-con Loch Ness Monster scale, the discovery of this fossil continues to argue the case that the vast mysteries of this world remain to be revealed. Maybe nothing illustrates this point as much as this compilation of the strange and previously unknown specimens of living sea life which were washed ashore as a result of the cataclysmic tsunami caused by the Indian Ocean earthquake of 2004. Interesting side note, although not normally considered a hot-bed for paranormal activity, Scandinavia recently made SuperNatural news with the riveting reports of a profoundly anit-social primate named Santino who was taking up arms against the zoo’s keepers and guests.